I've been running these wires through this beater so long now it all looks like a plate of spaghetti to me now and it seems I can't figure out how to parallel my subs now. I'm guessing most if not everyone has far better equipment than I so if you need to point and laugh help yourself. I've rewired this frankenstein 4 or 5 times just to learn how and why. 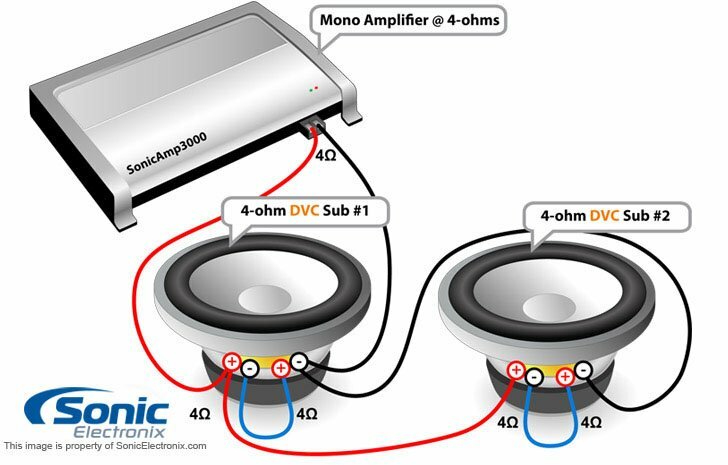 At the moment I have 2 speakers on every channel in parallel so amp sees 2 ohms across the board. All work and sound… meh… decent for what they are except subs. Ill include my chicken scratch drawing of what I've got and done. Sub 1 is a pioneer ts-w30034 dvc (4+4)600rms and sub 2 an alpine sws-12d4 dvc (4+4)500rms. I have them on a pioneer gm-a5702 2 channel bridged. I believe I have the alpine right showing 8 ohms and you'ld think that matching the pioneer to it would be easy…. I'm ready to get my shotgun at this point. I bought the alpine as display model from B B for $50 so no box and the pioneer from a buddy who upgraded so also, no box. Alpines site is a breeze and easy to follow. Pioneer's not as illustrated. Both work great when wired to their own channel at 2 ohms each so I know the amp and subs work but when I run parallel bridged I get nothing and I'm not trying to ruin anything. I wired sub1 coil 1+ to coil 2-, same for sub2, then sub1 coil 1- to sub2 coil 1- and sub1 coil 2 + to sub2 coil 2+ then sub2 coil 2+ to amp ch 2 + then sub2 coil 1- to amp ch 1-. Illustrations from pioneer, alpine, and crutchfield, to me, say it's right. Am I just retarded or what? I can take subs out of boxes and take some pics if needed. If anyone can read my drawing would someone pls tell me if I put the capacitor in the right spot or if I should even use it. The fuse block after it is redundant but couldn't find a straight block locally so…. Thanks for any help Some added notes. Is the 80a fuse off the battery big enough? And yes I realize that the pioneer 6x9's will be destroyed if left in current set up. just wanted to see if I could make it all work. Thx. I have that though. Haven't went out and looked at it for awhile. It will probably be obvious when I do. Thought a second opinion might help. One last thing, take the time to clean up wiring. It doesn't have to be the art work some guys do. But it should be tidy and secure. Hook them up to 1 channel each, the way it works. OR one ohm stable amplifier for serious Bassheads! Your amplifier may be unable to handle load! 4 ohms "bridged" equals 2 ohms.